I am looking forward to seeing the work all together in a nice space away from the studio, I usually look at them anew when I see them in a different setting, it is akin to letting my babies go out to fend for themselves. I would like to thank in advance both Margaret Flannery and Mary Flynn. Margaret the arts officer for all her assistance and Mary who has kindly agreed to do the honors of opening the exhibition. Also showing is Limerick artist Nuala O'Sullivan, so Best Wishes to her. When the date for the opening was originally decided I had not realised that it was on the Friday of a Bank holiday week-end, so I am a little worried that it will be a small gathering, so if you plan on attending I really appreciate it. I know geographically it is not possible for many of you and others will be away doing fun week-end stuff! It will be on until July 3rd so plenty time to drop in and see it. I will take some photographs of the opening to put on my next post. Below is an extract from the press release for the exhibition. 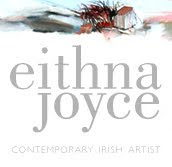 A Whispering Landscape is a collection of new work by Galway artist Eithna Joyce. Graduating from G.M.I.T. in 2005 she has had several exhibitions to date, but this, her first show in Galway, is of significance given that her paintings are inspired by the contrasting landscapes in her life; the East Galway farm where she lives and Connemara where she was born. Just as a whisper is a quiet utterance, transmitting a message to an intimate audience, A Whispering Landscape breathes softly; quiet and still in both colour and content. This collection is characterised by its stripped-down realism where the landscape is a mixture of reality and memory, and through the painting process a new, imagined reality is created. Many of the paintings convey 'local' with place names as titles, such as Ootid, Shanakeela and Finisclin, townlands within Recess, where she was raised.